I adapted this Curried Ginger Carrot Soup from the Carrot Ginger Soup I have been making for years. I originally found the recipe on a site that archived the recipes from the usenet group rec.food.recipes, a group that is now sadly defunct. That is also the site where I found the sweet and sour cabbage soup recipe that I love so much. The first time I made the recipe I added the tablespoons each of curry powder and cardamom for which it called. The result was almost inedible, the spices were so strong. I reduced the amounts to a teaspoon of each and the results were much more palatable, and I made it frequently. I believe this was the first recipe that I made with my stick blender (which, again, I feel the need to mention HOW MUCH I LOVE), which made it all that much easier to make. But over the years it has fallen by the wayside, and even though I almost always have carrots on hand I haven't made it in a few years. I have thought about it now and then, but something else always catches my attention and I have kept it just hovering there in the background, knowing that it is there if I need it. I think one of the other reasons I haven't made it more often is because of that extra step of having to mince both the garlic and the ginger. My recent discovery of garlic ginger paste has taken care of that problem for me, though, so that might be why I finally decided to make this soup again. In the intervening years between the last time I made this and now, my knowledge of Indian cooking has grown, and so has my collection of spices. Instead of just adding just curry powder and cardamom, I decided to create my own blend of spices. And, since I had some on hand, I threw in a little bit of cream at the end. What I love about cream is that it only takes a little bit to make a big difference in the overall taste and texture. Be careful, though, because too much can overpower the more delicate flavor of the carrots. This version of the soup turned out to be quite delicious. It would make an excellent starter, or a satisfying meal in itself with some pita bread and a nice big salad. simmer until the vegetables are tender, about 10 minutes. and heat through. Remove from the heat and add the cream. 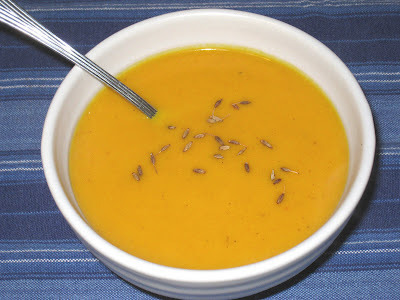 Top with cumin seeds and serve.